Civic associations aside, First Lady is a term that characterizes Somali model Halima Aden. Among her achievements of firsts, the most visible is that of being the first ever hijab-wearing model in the world of fashion, though there are much more. Recently, Halima became a UNICEF Ambassador and strives to one day become a UN Ambassador to return to Kenya and instill hope in refugees. Halima was born in Kakuma, a refugee camp in Kenya, after her family fled civil war in Somalia. She lived there for seven years with her parents before traveling to the United States and settling in Minnesota. Though she spoke Somali and Swahili, Halima was thrust into an English-speaking school system that lacked a language immersion curriculum entirely. Despite this seeming detriment, Halima quickly found herself in advanced placement English classes in high school – outperforming her classmates and demonstrating the resilience that makes her a powerhouse today. 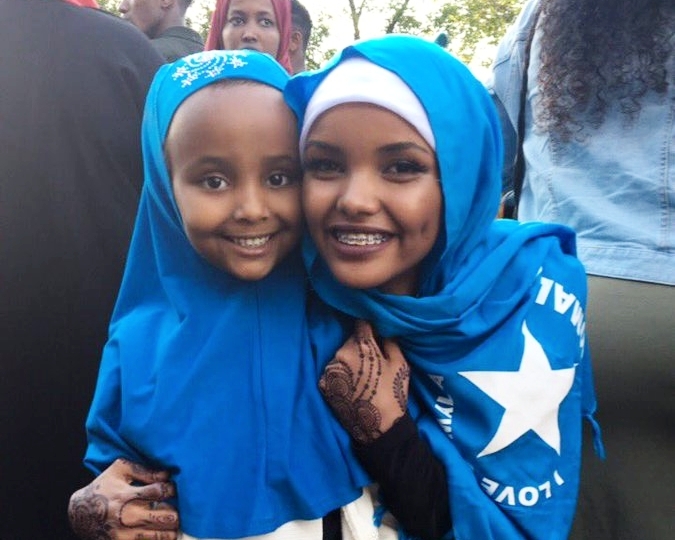 Continuing in her roster of early accomplishments, Halima holds becoming her high school's first Muslim/Somali homecoming queen as one of her proudest moments. Her inspiration-inducing presence, of course, only began in her St. Cloud, MN high school. Halima first made headlines after competing in the Miss USA pageant wearing a hijab and sporting a burkini in the swimsuit portion of the competition – a first in the 65-year history of the event. She finished among the top 15 finalists but won a bigger prize overall. Her performance caught the eye of Carine Roitfeld who recruited her to appear in what was Halima's first editorial. The CR Fashion Book cover (another first), however, came as a surprise to Halima and marked the beginning of a new cultural phenomenon. Since then, Halima has covered Vogue Arabia and Allure in which the publication heralded her as an all-American beauty, a crucial acknowledgment for America's Muslim community. Editorial credits for Halima also include Harper's Bazaar and Glamour, and she appeared on the runway for Yeezy, Alberta Ferretti and Max Mara. Most recently, entertainer Rihanna tapped the glowing beauty to appear in the campaign for her inclusive beauty brand, Fenty Beauty. Regardless of the meteoric success Halima has garnered, her altruism is what leaves the people she encounters breathless. Not only because it is a rare trait to find amongst most 20-year-olds, but also because it is so genuine Halima must be prompted to turn conversations onto herself. Halima understands trauma that leave children vulnerable to exploitation and abuse. As their staunch advocate, she hopes to remind them that they are not forgotten. A breakout model who became the first hijabi to grace the cover of CR Fashion Book, Halima is not shy about modesty and provocation in fashion. Halima dazzles the runway but loves to go back to the beginning, cleaning hospital rooms in a St. Cloud hospital. To her, both are part of who she is. Halima broke barriers as the first hijabi model on the cover of British Vogue, challenging industry norms and working to define the face of fashion for a new generation. Halima advocates for girls and women to be comfortable owning who they are and remain unapologetic in their uniqueness. Halima uses her platform to give a voice to young Muslim women in the fashion industry so they have a chance to be heard. Returning to her birthplace, a Kenyan refugee camp, Halima inspired refugee children to become agents of change.